I am upgrading to a Nest thermostat, and have two wires in my wall: Rh and W.
Congratulations! Based on your picture it does appear that your system is compatible with the Nest Learning Thermostat! It appears that you a conventional heating only system. The red and white wires coming through from the back of the thermostat are what will need to be connected to Nest. The red wire will be connected to the Rh terminal for power and the white wire will connect to the W1 terminal for heating. Unfortunately neither they nor I realized that I had an ancient millivolt system that was actually incompatible with Nest (I figured it out when I traced the thermostat wiring after a power outage a few days ago). FYI: I have what appears to be two insulated wires, and not a single copper one, it's my understanding that the millivolt power is coming from a thermopile (vs. a thermocouple). •Which of the 24v wires (+/-) goes to which terminal (C, Rh)? • Is it really okay that the 0.7VDC furnace/millivolt Rh wire and one of the 24VAC transformer wires will be on the same Rh connector on the Nest? If I understand correctly, the reason it doesn't matter that I'll have two wires on the Rh connector is because they are part of two different circuits--is that right? Anyway, please let me know if I understanding any of this incorrectly. Last but not least, here are some of the step down transformers I found. Would any of them work? Thanks in advance! I apologize that this is so long, but I wanted to be as specific as possible. Question about the Nest thermostat? Does it use batteries? If so you should simply be able to install the Red wire to RH and the white wire to W. Otherwise you will need a 24V transformer and a spst relay (24VAC coil). Hi hvactechfw. It does have a built-in battery, but it needs to get recharged off the C wire, so I will need the 24v transformer. Why do I need a "spst relay (24VAC coil)"? Will it not work if I just wire the 24v transformer wires to C and Rh? IF you have a milivolt system then you can not do that! When Rh and W are shorted that connects the milivoltage produced by the thermopile is transferred from the Rh wire to the W wire which connects to the gas valve completing the circuit. If you were to interject 24VAC on the Rh terminal you could ruin the gas valve. A milivolt system is a DC system which uses less that 1VDC. Are you sure you have a Milivolt system? It very well could be that you have a 24V heating only 2 wire system which is not a milivolt system. Wow, thank you very much for explaining that. 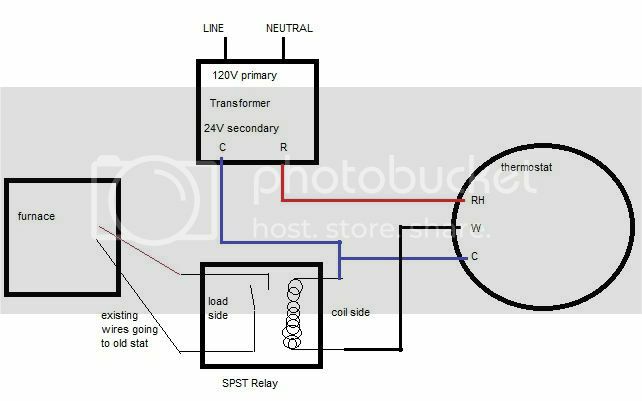 In that case, can you tell me more about the spst relay (24VAC coil)? How does that work/where does it belong in the wiring diagram? Thank you again! I've done a lot of internet research and asked this question to multiple people and no one has known the answer except you. Edit: Yes, I am sure that it's a millivolt system. I traced the wires all the way to the furnace, and they end at what I assume is the thermopile (the wires go into a small box next to the pilot light). The furnace has no other electrical wiring on it or near it, so it must be millivolt. DO you have a millivolt system? That is the first thing you need to be sure of. I also do not understand how Nest said that your system would work when you need at least 3 wires to the thermostat for it to operate (you said you need to connect C) so you would need wires on Rh, W, and C. do you have the ability to run 3 wires to the stat? Do you have an extra wire in the loom already there and not being used? Nest is compatible with 2 wire 24v systems that have only Rh and W and Nest Support thought that's what I had (and also what *I* thought I had) until A) We had a power outage, and the thermostat continued to work and B) I traced the wires from the thermostat all the way to the furnace, and noticed that they end at a small box right next to the pilot light. And there is no other wiring running into or out of the furnace. As for my existing wiring—currently there are only the two millivolt Rh and W wires running to the stat, but I do have the ability to easily run as many extra wires to the stat as needed, so that's not an issue. The wiring is very accessible. Can you provide me with a link to a installation manual. The pdf file on the Nest website is corrupted. You implied that nest is compatible with 2 wire systems. If you must provide 24V to the thermostat then that is not possible with only 2 wires as then you are left with no signal wire back to the furnace. HOW DO YOU KNOW YOU HAVE A MILLIVOLT SYSTEM? Nest is "compatible" with 2 wire 24v systems because it can charge itself using the AC supply for the heat signal while the heat is on. It then utilizes its battery until the heat is on again, at which point it again charges itself during the time the room/building is being heated. How well that actually works in practice is another question, but it IS supported by Nest, and you can verify this by using their compatibility checker. 1) We had a power outage, and the thermostat continued to work, even though literally *nothing* else had power, and there is no battery backup in the existing thermostat. 2) I traced the wires from the thermostat all the way to the furnace, and noticed that they end at a small box right next to the pilot light. There is no other wiring running into or out of the furnace. Here is the link to the Nest install guide. Edit: I just downloaded it and opened it. It is not corrupt. for some reason I can not download it. Check for a PM from me. By the link you gave for the incompatibility with single stage wiring, that is exactly what I was thinking and that you will need to have 3 wires to the stat for reliable operation. I will draw you up a schematic. Alright, I just emailed you the install manual for the Nest. Thank you drawing up a schematic! That should really help clarify things. I looks like you have your answer on the wiring. I work FT as a Home Energy Rater and Auditor. I installed my new Nest about 10 days ago. My question is not about the wiring, but why you are not replacing your extremely old and wasteful floor furnace with something much more effective and safe a few bucks at the same time? Unfortunately we are in an apartment, so we can't make those types of upgrades. I can only do this upgrade because it's very simple, and all it's going to take in terms of alterations to the building is two screws inside my closet to mount the transformer. One of the reasons we specifically want the Nest is for safety re: the floor furnace. The Nest has motion sensors/auto away functionality and ability to remote control via iPhone app. This is important because about a week ago, the dog dropped a tennis ball on the floor furnace while we were watching a movie, and the whole room filled with smoke before we noticed. We managed to catch it since we were home, but it'd be great to have the thermostat shut off the heat automatically if we forget to do so, and also great to have the ability to shut it off even faster via the iPhone app (e.g. if we remember that we forgot to turn it off when we're half way to our destination). On a related note, I upgraded our fire alarm to a dual sensor (ionizing/photoelectric) model so that it will better detect smoldering fires. It is possible that what you are trying will work, depending on how the thermostat is designed. The reason is that there are two independent circuits. Remember that current has to flow in a complete circle. Drawing it out on paper may help. The first circuit connects one terminal of the transformer to RH, through the thermostat, out C and back to the other terminal of the transformer. That provides 24VAC between the RH and C terminals and powers the computer circuitry of the thermostat. The other circuit is furnace thermopile to RH, through the thermostat heat switch, out the W terminal to the gas valve which is grounded to the other side of the thermopile. This circuit sees only the 750 mV of the thermopile. Since there is no connection between the gas valve/thermopile and both terminals of the transformer, this circuit does not see the 24VAC. This means that making the connections as you propose should work. Just make sure that the C wire connects only to the thermostat and to the transformer and is not grounded to anything else in the system. Since the 24V is AC and not grounded, it doesn't matter which terminals you connect to RH and C.
As a side note, on a more typical 24VAC system, one terminal of the transformer connects to RH and the other terminal of the transformer connects both to the C terminal and the gas valve through the W terminal. So in this case, 24VAC goes through both circuits. So how does the thermostat computer get power if there is no C wire on a 4-wire system? In this case the power for the computer is generated by the connection between RH and W. This current is the same that would turn on the gas valve, but when the heat switch is open, only a tiny amount of current flows to provide power to the computer, not enough current to activate the gas valve. Since your 24VAC transformer is only providing a tiny amount of power to the thermostat computer, your transformer is way overkill. Instead of 50 watts you probably only need 1 watt since the transformer is not powering the relays in the furnace, only the computer chip. So you could use a much smaller transformer but the one you selected is okay. By the way, one way to test this is to first connect the transformer to RH and C. This should provide power to the thermostat computer. Also connect RH to R on the furnace. This provides the thermopile voltage to the heat switch. Do not connect the white wire. This will prevent any possible damage to the gas valve. Then adjust the thermostat to turn on heat which closes the switch on W. You probably will hear a click as the switch closes. Measure the AC voltage between W terminal and the white wire. It should be 0. Then measure the DC voltage between the W terminal and the white wire. It should be about 750 mV DC (assuming the pilot light is on). Next adjust the thermostat to turn off heat. Both AC and DC voltage between W and the white wire should be 0. If so, hook up the white wire and you are good to go. The SPST relay method will work, but shouldn't be necessary if the thermostat is designed as expected with the W and C terminals isolated. rystic: I'm glad I found your post. Thanks for doing the leg work. I got my Nest thermostats yesterday and didn't realize that my free-standing propane stoves are millivolt systems until I talked to Nest support. He suggested a 24VAC relay, but from what you've posted it looks like a simple adapter will work. I will give that a try and report back. This transformer looks pretty ideal. I can't imagine the Nest takes more than 1.67A, but I've got a message in to support asking about the current requirement. I've bought lots of stuff from BG Micro. Since I wanted to mount this in my closet (where there are no outlets) next to an existing light, I went with this one and mounted it on a standard 4x4 electrical box. Your solution seems a lot easier though, if you have an outlet nearby. As far as the current goes, according to the Sparkfun teardown of the Nest, it uses "2.1Wh over 3.7V." So according to the calculator I used, the current should come to 0.58 amps. That quote from Sparkfun is the capacity of the battery. It doesn't really tell you how many amps Nest needs. The calculator you linked to doesn't have a field for watt-hours. But I'm sure the transformer you're using will work. Have you hooked everything up yet? Were you successful? Whoops, you're right. I misread (thought it said W when it was Wh, and didn't realize Sparkfun was only talking about the battery). Definitely do let me know what Nest says when they get back to you. As for my install–no, it's not finished yet. I'm hoping to have some time later today. I'll post here when I do get it finished though. I got the first of my two Nests hooked up. The transformer is connected between Rh and C and the stove is connected between Rh and W. Everything seems to be working great so far. The other transformer is going to have to go in the attic so it will be a little more work. You can't really put two wires into the Nest's terminal so you'll need to splice the wires from the transformer and heater together with one wire that goes to the terminal. If you really do have a millivolt system you are going to let the smoke out of your gas valve by wiring it without the relay. A millivolt system runs on 750mVDC. When the thermostat calls for heat it connects RH and W. Using your transformer you connect RC and C and from your millivolt system you would connect RH and W. This will only work as long as RH and RC are not internally or externally connected otherwise you need to use a relay. Not all 2 wire systems are millivolt systems. Goodluck with your endeavors. If you really do have a millivolt system you are going to let the smoke out of your gas valve by wiring it without the relay. So far it's working fine for me. I have the red wire from the stove and one lead from the transformer connected to Rh. The white wire from the stove is connected to W. The other lead from the transformer is connected to C. The Nest gets its power from the Rh/C circuit. It's controlling the heat through the Rh/W circuit. There doesn't appear to be any connection between W and C, so the gas valve isn't getting 24V. there are two independent circuits. Remember that current has to flow in a complete circle. Drawing it out on paper may help. *Via a pigtail wire splice due to limited space on the Nest terminal. I heard back from Nest support. They said "Nest draws between 30mA – 100mA, where 100mA is the optimum amount." That's pretty minimal. The transformer I ended up using supplies up to 1A, so it's plenty for the job. Got the second Nest hooked up last night. This one involved crawling around in the attic to do the wiring and install the transformer, but it went surprisingly smoothly. I got a big 24VAC transformer from eBay. Probably way overkill for this application. Sorry for ressurecting an old thread but it fits in with powering a Nest. I've got a Goodman Heat / AC unit - it is about 13 years old - nothing fancy about it. Nest wiring adviser says I should have no problem with my standard R, Y, W, G wiring. I've read the problems about the Nest not getting enough power and ideally a C wire would solve any potential problems. From what I can see and find - I'm not sure where or how to get the C wire off of my control board of the unit. I would appreciate any help or insight how I tap into the power supply of the unit and run to the thermostat as a C wire. Goodman uses the furnace body for C.
Connect the new thermostat C wire to a screw on the furnace body. Great info and thanks for that information. This makes it easy for me since I've got an extra wire already in the wall and just loose on each end. Would you mind helping my feeble mind then! If the C is nothing more than ground - does that mean it just gives the thermostat the ability to pull the power out of the R wire at all times - the C - giving it the ability to complete the 24v circuit back to the unit at all times rather than just when the fan is on? So really it always gets power from the R? I wasn't understanding - I thought the C was going to give me the circuit not just a "ground" - a way to complete that circuit. I used the wiring diagram provided in this thread by hvactechfw on 01-22-12 to connect my Nest thermostat to my Quadrafire natural gas stove with millivolt contacts for the thermostat. That diagram allowed me to successfully install my 24 v Nest thermostat to my millivolt stove without damage to either. The cost of the 120 v to 24 v transformer and the SPST Relay with a 24 v coil was less than $40. Thanks for the great advice. I have a similar question to this thread that I am hoping hvactechfw can confirm and clarify. I plan on installing a Williams 3003622 direct vent wall furnace at my 3 season lake house. This is a millivolt system and this is a link to the installation manual for any questions http://e-wfc.com/pdf/Direct_Vent_Furnaces_IOM.pdf. This furnace will be used instead of existing electric baseboard heat. I want to install a Honeywell WiFi thermostat so that we can turn the heat on remotely and have the main part of the house up to 70 degrees when we arrive 3+ hours later. This is a link to the thermostat manual http://wifithermostat.com/assets/pdf...ish-French.pdf. Referring to your post on installing a Nest thermostat on a millivolt system and the drawing that you posted on 1/22/12... will this work for my requirements above? It all sounds the same to me. If yes, can you 1) recommend part numbers for a 24vac transformer that is not overkill and a recommeded spst relay? and 2) can you add wire detail for the gas valve to relay connections. Does the wiring not matter? Same question on coil to thermostat side... can W and C go to either terminal on coil side? Thank you in advance for sharing any expertise. I should add that I have to install the optional blower as well on the furnace to move the air around in the area. Last edited by hvactechfw; 03-03-13 at 08:11 PM. Thanks for all of the detail hvactechfw. The Honelywell support center must be out of India and was useless. Regarding the wiring instructions by hvactechfw. I have followed the directions for installing my Nest with millivolt fireplace. Everything is working just great. Thanks for providing such great instructions. I am only having one issue. The Relay is buzzing. It is a brand new relay, and I used exactly what was specified. I checked the voltage with the Relay completely wired, and I am getting 27.4 volts. I then check the voltage wiring the Relay direct to the transformer, (bypassing Nest, etc) and I am getting 27.7 volts - so the drop is very small. Any ideas on what would be causing this? Could the Relay just be bad? Did you try running the relay directly from the transformer. If it chatters then..... replace it. There are so many imitation/knockoff relays on the market it could just be defective. Will a generator run an electric oven?